There are parties, and then there are eight-day-long parties filled with fried food, games, and presents. I have never been to one of the latter before, which is how, on the second Sunday in December, I find myself standing by the gates of the Chesed-El Synagogue, waiting to join the congregation for their final Hanukkah event of the year. Hanukkah, a Jewish holiday also known as the Festival of Lights, commemorates the success of the Maccabean Revolt, a military campaign launched by a group of Jewish rebels to reclaim Judea, now modern-day Palestine, from the Selucid Empire in 167 BCE. 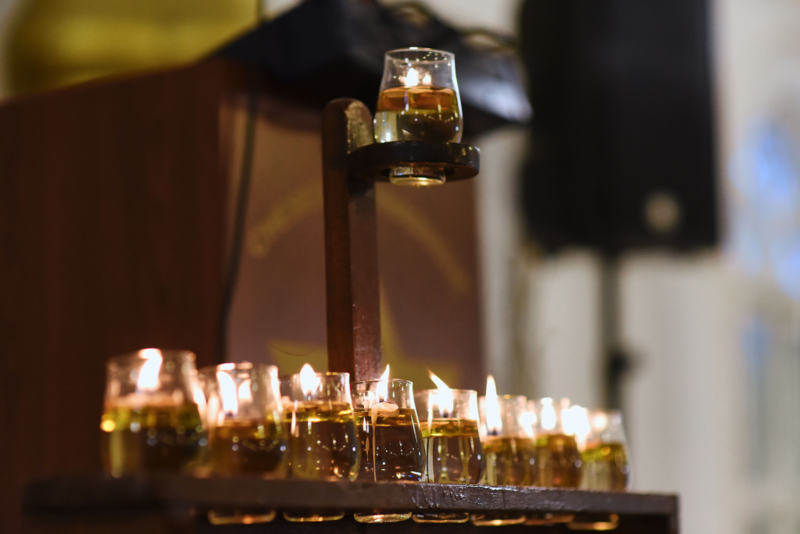 Upon recapturing Jerusalem and reclaiming the Second Temple, the Maccabean rebels found only one jar of oil in it—barely enough for a night’s ritual use—but the single jar kept the temple’s lamp burning for eight days and nights. Nearly two millennia later, these events are celebrated by Jews the world over as a symbol of the endurance of Jewish identity. The Chesed-El Synagogue, tucked away in the hilly neighbourhood of Oxley Rise, is the second of two synagogues serving the local Jewish community. 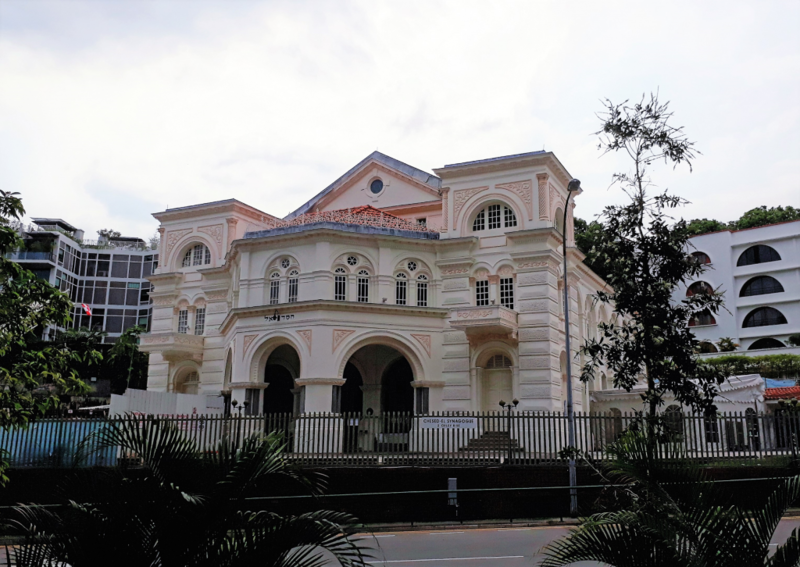 The first, the Maghain Aboth Synagogue in the traditional Jewish quarter of Waterloo-Middle Road, was built by Sir Manasseh Meyer, a Baghdadi Jewish merchant, philanthropist, and community leader, in 1878. 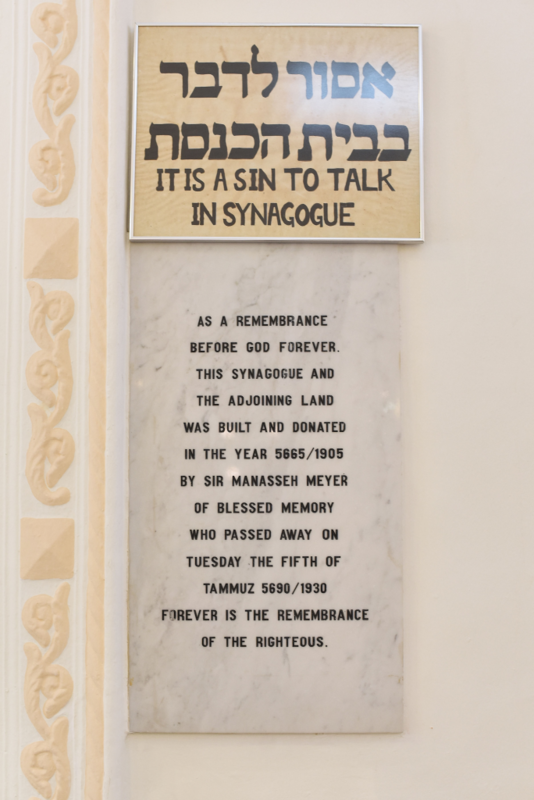 When the community grew too large and fractious for one synagogue to accommodate, Sir Meyer commissioned the building of the Chesed-El, which opened in 1905. 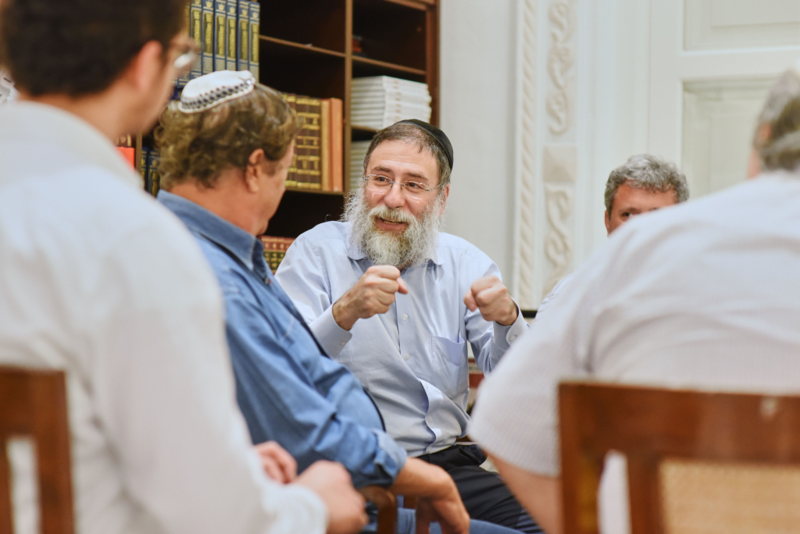 Today, led by Rabbi Jean-Pierre Fettmann, it serves a congregation of around 150 members of diverse backgrounds. 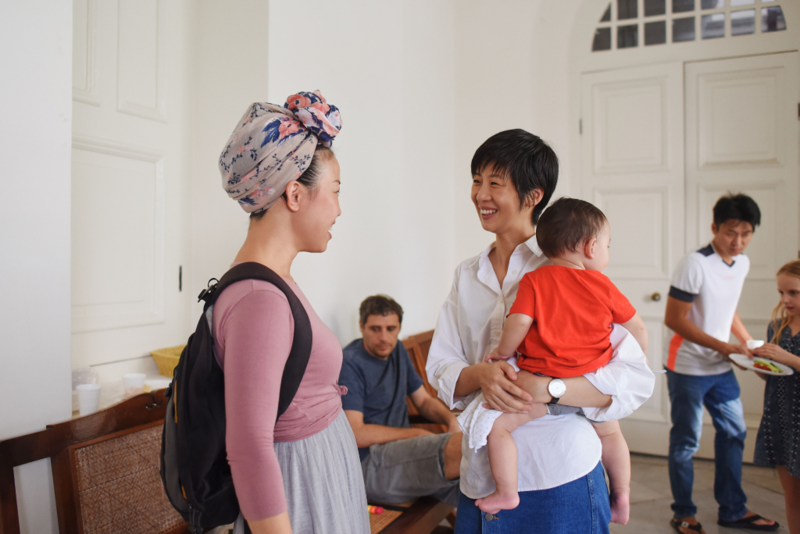 While early Jewish Singaporeans were mostly Baghdadi (Indo-Iraqi) Jews, the community today is mostly made up of immigrants from all around the world, including the US, Australia, Israel, France, and the UK. 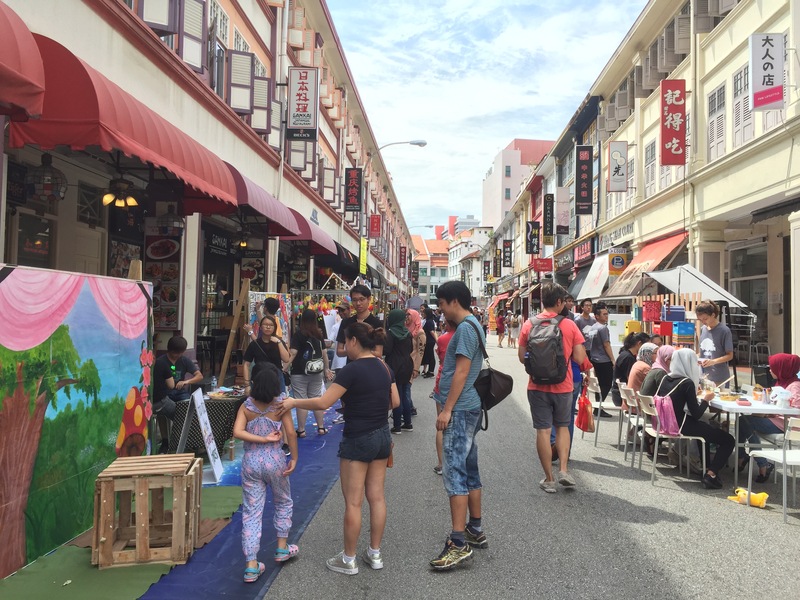 Community leaders estimate there to be around 3,000 Jews in Singapore, though only under a thousand of these are practising. We arrive at the synagogue early, and the building is nearly deserted. Apart from a stack of paper plates and soda bottles by the entrance, there’s little indication of the festivities to come. With only one or two guests around, we take the opportunity to roam the building. 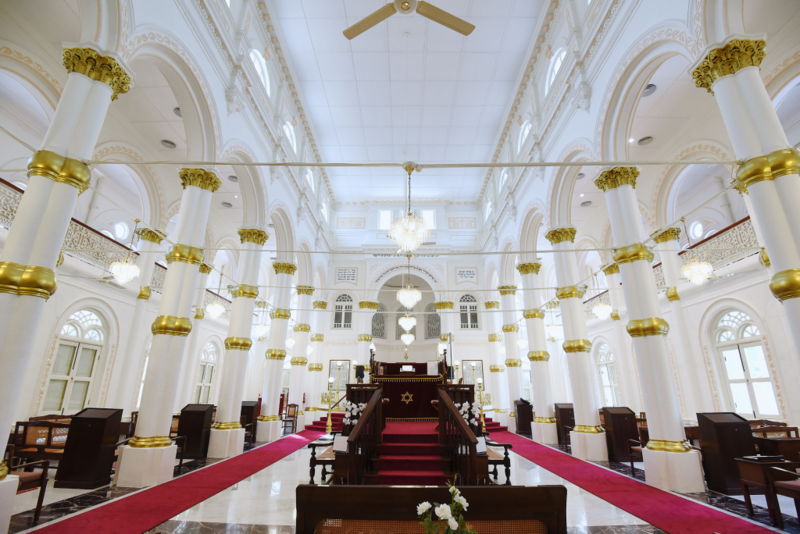 The rain which has plagued most of December has subsided; this afternoon, sunshine comes streaming in through the windows, bathing the synagogue’s Palladian architecture in light. The sight is breathtaking, and I find myself wishing that I didn’t have anywhere to be or anything to do except drink in the silence. Eventually, however, the sound of children’s voices filters through the hush. Suddenly, and all at once, it seems, the party has begun. I make my way over to the tentage in the synagogue’s yard, which is set up like almost like a condominium’s function room, complete with adjoining kitchen. Inside, around 30 to 40 children, from toddlers to 12-year-olds, their parents trailing behind them, have gathered for the kids’ programme. Tables are scattered with colour pencils and crayons for a colouring contest, as well as bowls of crisps and multicoloured dreidels (a small four-sided top, beloved by children at Hanukkah parties). An event team has been hired to help the children craft DIY acrylic keychains of their own design, and a foosball table has been set up in the middle. Someone tells me the grand prize is an iPad. 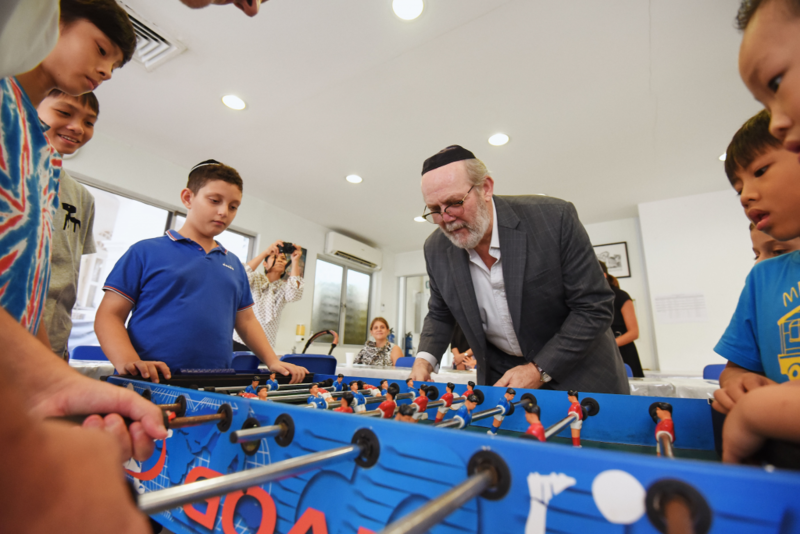 Rabbi Fettmann facing off against young congregants in a game of foosball. As I weave in and out of the crowd, I start to feel like I’ve gatecrashed a sort of Christmas party, five-year-old’s birthday, and Sunday School fête all rolled into one. 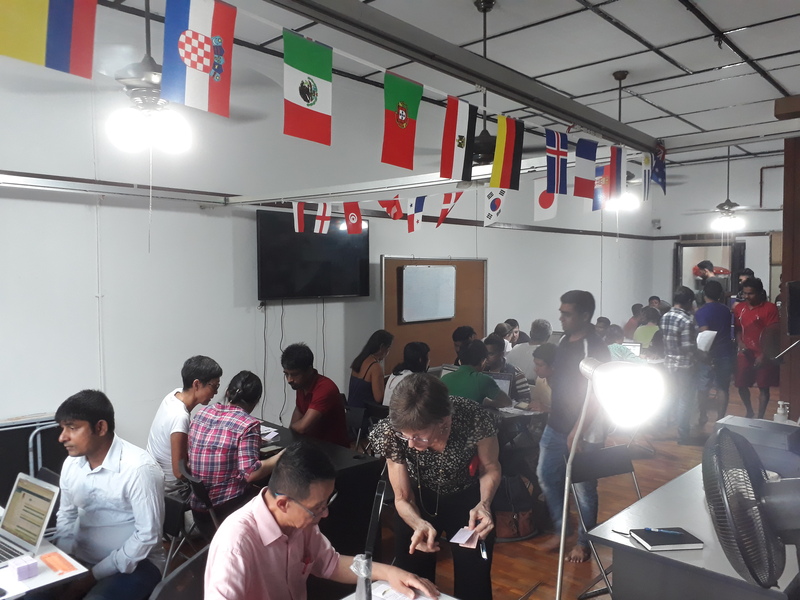 The combination of the familiar and foreign is disconcerting; in many ways, it’s like any other community gathering I’ve attended—the parents chatting in the corner, the bowls of junk food and the party games—but with just enough elements of difference to make me look twice. 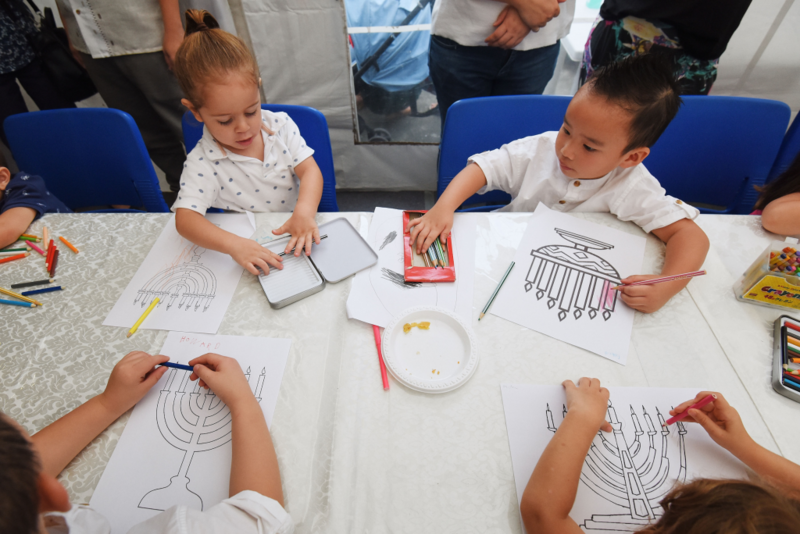 The boys are all in yarmulkes (brimless skullcaps), and instead of cartoon characters or scenes from books, the children are colouring in menorahs (the iconic nine-branched candelabra, of which one candle is lit for every night of Hanukkah). 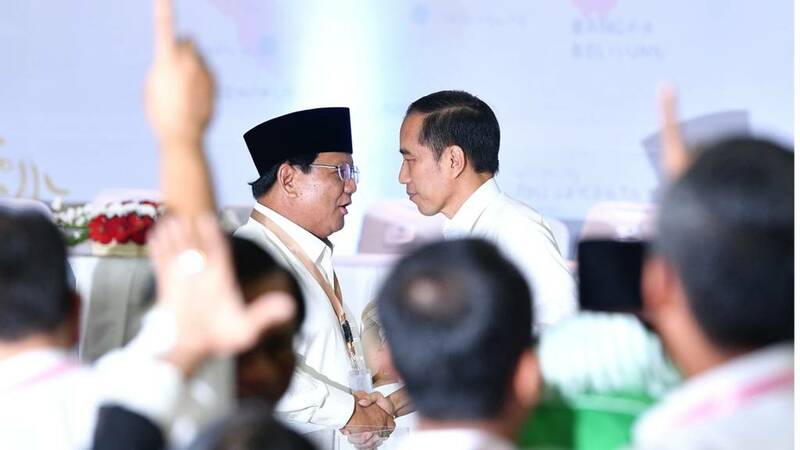 And then, to my surprise, I see a Chinese face in the crowd. Jack (background), with his wife and one of his sons. 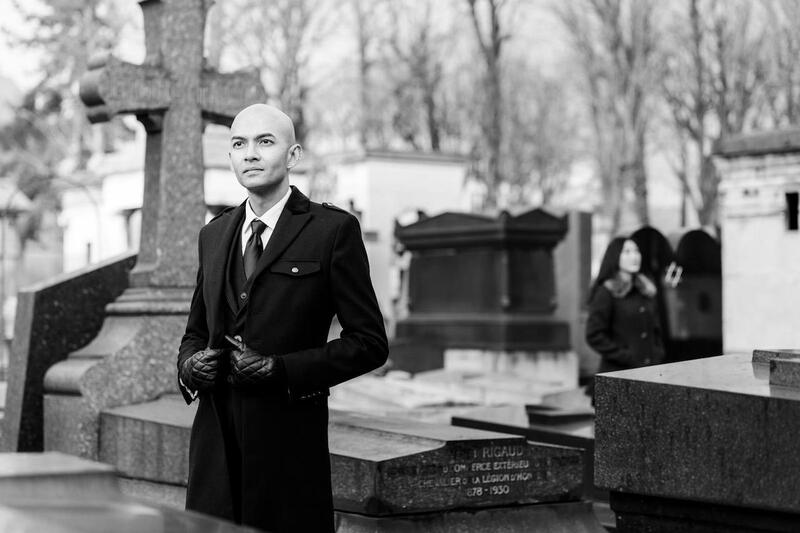 Jack, 37, is a Noahide, or a non-Jewish person who abides by the Seven Laws of Noah, a set of Jewish religious principles set out by the Talmud. The local Noahide community, which numbers around 30 to 40 members, do not observe all aspects of Jewish custom. For example, they do not keep the Shabbat, but meet regularly to study the Torah and attend events at the synagogue. 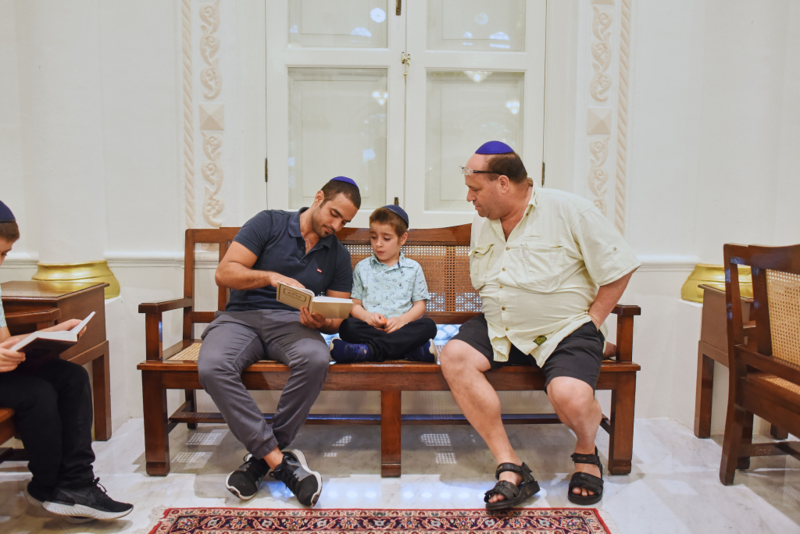 For Joseph, who discovered Judaism around five or six years ago, Hanukkah is a time to celebrate with the rest of the community and educate his three children on the significance and history of their faith. “In our lives, we have our highs and lows,” he tells me. This sentiment is echoed by Maggie, whom I meet by the synagogue’s entrance, not long after I flee the crowds of children for the safety of the drinks counter, where most of the adults have gathered. 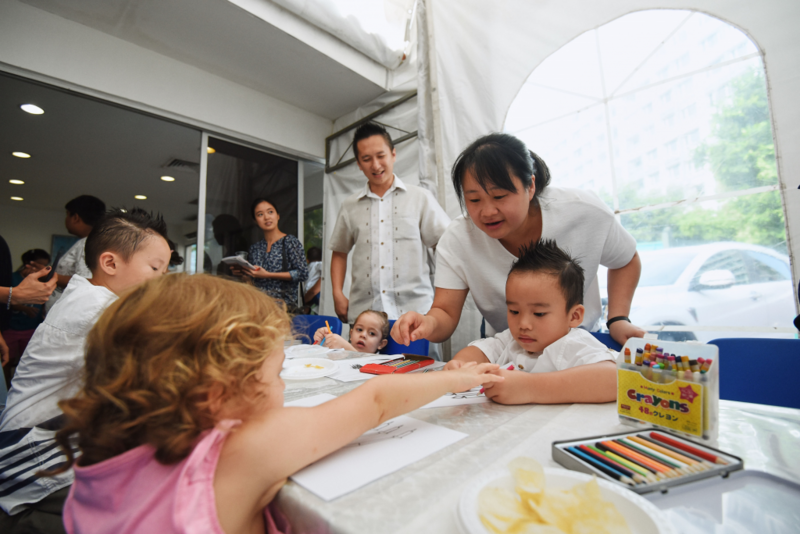 Maggie, 35, who was born in Shanghai and converted to Judaism upon marriage, moved to Singapore eight years ago, and is attending the festivities with her husband and their three children. Maggie (right), with her youngest child. 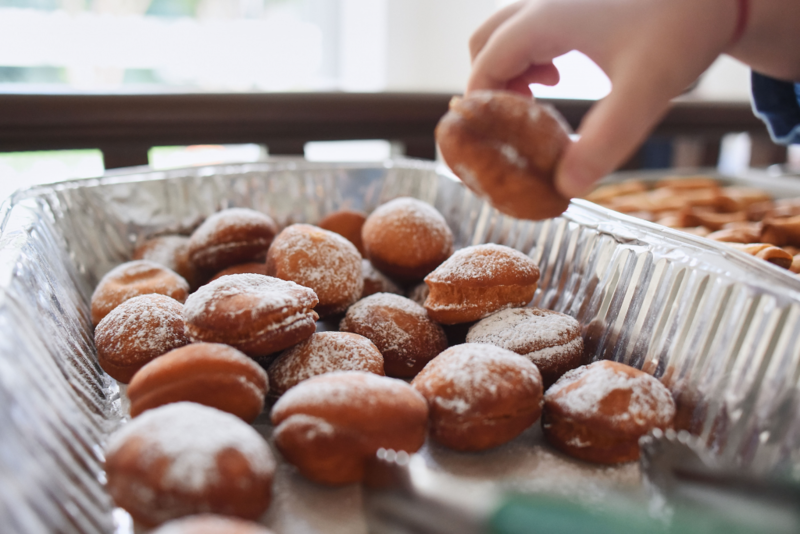 Eating fried food is a hallmark of Hanukkah parties—a delicious, if greasy, celebration of the miracle oil which the Maccabean rebels found in the Second Temple. In addition to the sufganiyot, there are spring rolls for a dash of local flavour. Aviv also points out the bourekas, a kind of pasty that’s usually filled with potato or cheese, and which he sometimes likes to make himself. Sadly, by this time, the latkes, a kind of potato pancake similar to a mini potato rosti, and a staple of Hanukkah feasts, are all gone. Apparently, the appeal of fried potatoes transcends all religions and cultures. I take my plate of food and drift between the entrance and the synagogue’s main hall, where the adults are mostly chatting in groups. A few boys have wandered over from the children’s tent and have taken out some religious texts for study. Before long, a couple of men come over to join them, guiding them through the Hebrew passages. This is but one of many small displays of warmth and generosity I observe over the afternoon. As a ‘minor’ Jewish holiday, Hanukkah is not the most overtly religious of the Jewish festivals; several people have joked to me over the course of the afternoon that it’s really just a big party. It is, however, a party in celebration of the bonds of community, and of keeping the flames of kinship alive between Jews of all generations. To that end, while it’s ostensibly open to the whole congregation, it strikes me that it’s the children whom the event is really for. 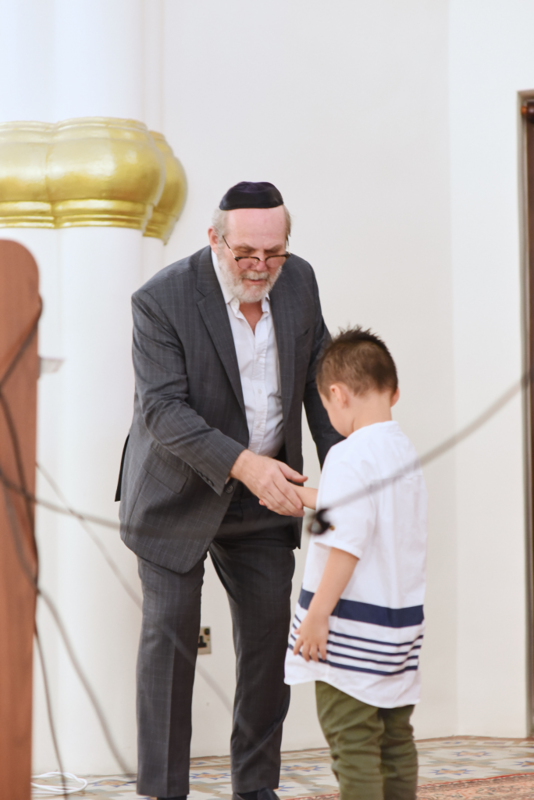 Their parents have brought them here for something much larger than a single afternoon of fun; it’s over these tables of games and party snacks that they – the future of the community, as Rabbi Fettmann remarks to me with obvious pride and affection – will learn to look at each other and recognise their kin. In the midst of this, I can’t help but feel like an interloper. In the middle of my ruminations, I bump into Anthony and Tania, a British couple I met earlier on in the children’s tent, who are attending the party with their young daughter and five-day-old son. The couple, who look remarkably relaxed despite the sleeplessness of new parenthood, tell me they haven’t even given their boy a name yet. 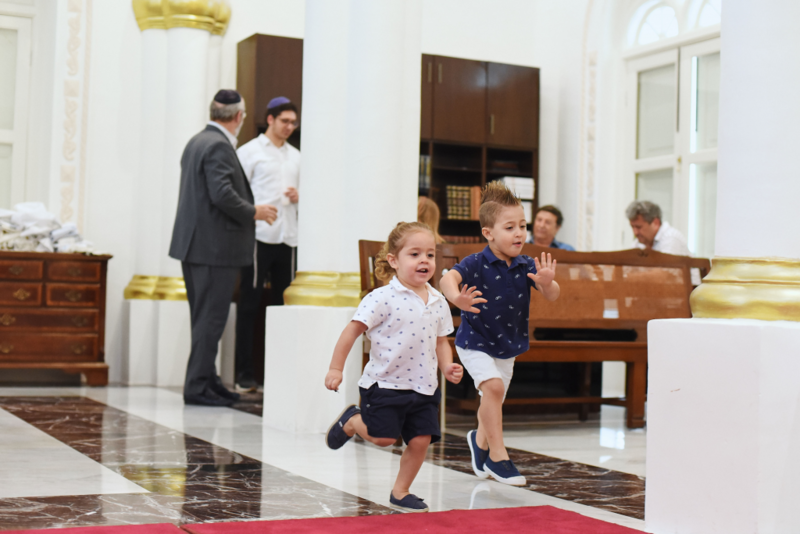 They are waiting for his brit milah (circumcision) ceremony, to be held the following Wednesday. They invite me to attend, and then, apropos of nothing, ask if I would like to hold their son. Their trust and openness astonishes me; they barely know me, after all. But when Tania passes her son’s warm weight into my arms, and his little fingers curl around mine, I find myself feeling a little less out of place. Shortly afterwards, the party begins to wind down. 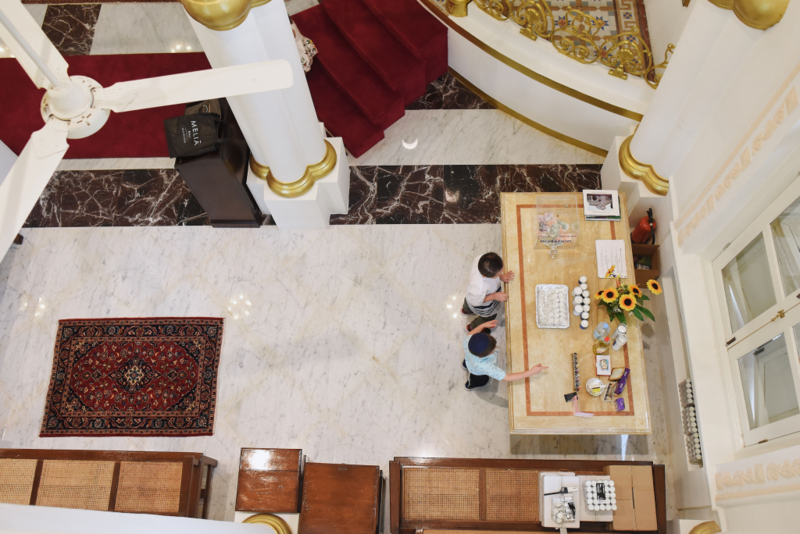 Half-eaten bourekas are left on plates, drinks are abandoned in their cups, and children are slowly shepherded back into the main hall while their indulgent parents trail behind them. Once everyone has gathered, Rabbi Fettmann announces the young winners of the various competitions, to the crowd’s obliging claps and cheers. Finally, to close the day’s festivities, Rabbi Fettmann lights eight candles, one for each day of Hanukkah. 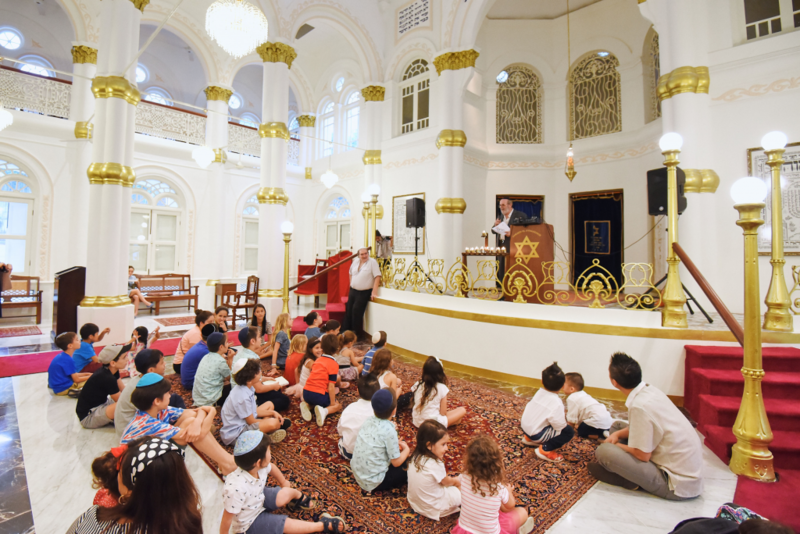 Together with Rabbi Abergel of the Maghain Aboth synagogue, he leads the congregation in singing Ma’oz Tzur, a Hebrew song traditionally sung after the lighting of the menorah. All around me, their voices fill the hall, bright and rich and resonant with joy. When I leave, the candles are still burning.